Hi Stampers, Welcome to the Christmas in July Blog Hop!! If you started here you may want to go back to the beginning at the Sparkle N Sprinkle Blog here:) With the hot sweltering summer heat it was a little refreshing to be cooled off with these fun new rubber stamps featuring the great artwork of Michelle Perkett! She is a new artist for Sparkle N Sprinkle, but she has been around for a while and has a whole line of digital stamps that Sparkle N Sprinkle is now carrying also! I chose to use "Woofie" for my card....I used Dimensional Glue and Flocking to make all the snow fluffy! What a fun card to send out to all my dog lover friends this Christmas. You can find all the details here for my card. You can look at all Michelle's digital images here and her rubber stamps here. Now leave me a comment and hop on over to Julie's blog for some more cool wintery ideas!! Jill, this is very cute!! I love the puppy. Super cute card. Very cute card - inside and out. I am lovin' the puppy card! Adorable! So cute! And I Love the candy cane bones with holly inside - so very festive! This one just makes you smile! Woofie is such a sweet image! 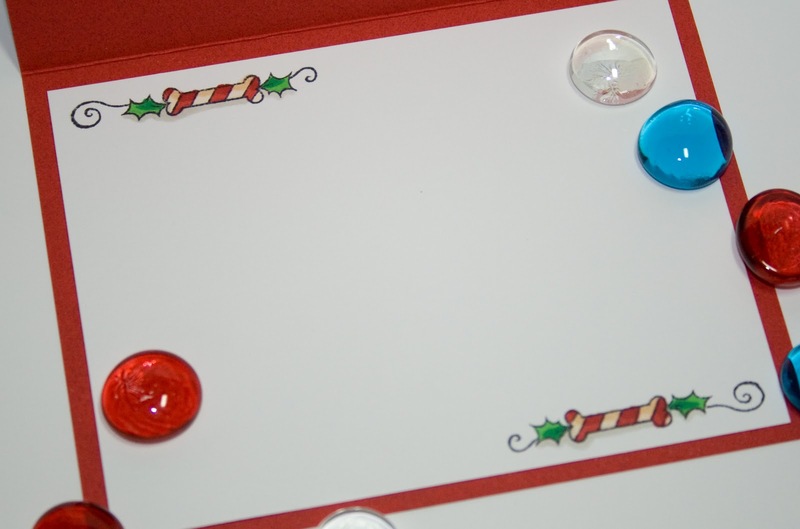 You did a fantastic job on this card and the inside is just as nice as the front! Love the clean lines! Just adorable Jill! I love that you decorated the inside as well....The candy cane bones are so cute and charming. Sweet card all around! Love this card! I may have to get this Woofie too! The details on this are fabulous! I love Woofie and you've done a great job with him! The candy cane bones are cute! Thank you for showing the inside of the card. Woofie is so cute! You did a great job! This is too cute! Love how you did the inside too! Woofie is very adorable. Like that you used flocking. I need to get started on Xmas cards!!! 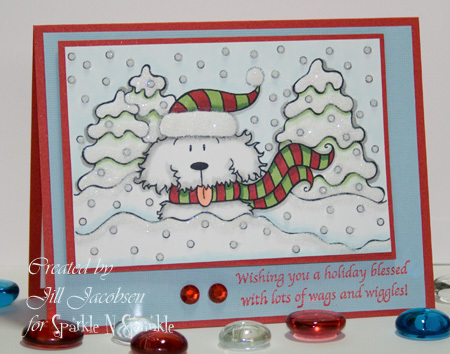 Gorgeous card, Jill! I love the woofie stamps! Such a cute little card and a cute little dog. I think that is the cutest image and a great card. I like it and will not get it in digital but if in rubber may be wanting it. Wonderful work - Scrap Lift here I come! great job. I am now in love with woofie. Alice L.
Woofie never looked better! This is a card everyone would enjoy receiving. Thank you for sharing. Your card is sooo cute. I just love this stamp. TFS. I just love Woffie. See you in a couple of months. Love the card. The stamp and sentiment are great! Woofie is toooo cute and the card is wonderful! Susan G; I love your cards. The Christmas one is so creative. Your imagination is great. I love how you colored Woofie & used the flocking. I'm definitely putting that stampette set on my wish list. Super cute Card love the Dog and the colors are Awesome. the Dog Bones are Cool. thanks for sharing. Very cute card! Woofie is ar really cute stamp. I like the colors you choose for your card. Love the card.. I really like the flocking of the snow. The candy cane dog bones are the perfect finishing touch! Oh my Gosh, you've really sold him for me!! Love what you did - so cute! Oh, this little Puppy couldn't be cuter! Love your sweet card! That is so cute how you have popped his little face up out of the snowbank. The glitter and bling really make it shine. This puppy is way too cute. He must become a part of my holiday collection. Jill... love the doggie!! Thanks for sharing! Jill, a really sweet card! love those layers. The blues with the red look great together! Love the puppy in the snow so cute.And you snow made with the flocking is great. Hot. Dog! What a COOl card! Very nice color combo. Neat and pretty.